Students will simulate the inheritance of alleles for physical traits and use those traits to create monster offspring. Models can be used to represent systems and their interactionsâsuch as inputs, processes and outputsâand energy, matter, and information flows within systems. This lesson can be done in just one class period of 58 minutes. However, I usually give the students two class periods so they have enough time to develop a great drawing. The students are then able to use these during our Student Exhibition Nights, where we open our doors to parents and community members. On these evenings, the students present their work in a student led conference. The student work created during this lesson lends itself very well to conferencing because it allows students to defend their drawings based on the data they generated and encourages them to explain their understanding to people who might be totally unfamiliar with the concepts. For this same reason, I don't copy the worksheet back to back. Students can paste both sheets into "folders" made of 12" x 18" construction paper, ready to be shared. Also note that the students will use the monsters they create today in three upcoming lessons (Punnett and The Rules, Incomplete Dominance and Co-dominance and Epigenetics). Students engage in several Scientific Practices – (SP2) Developing and Using Models; (SP4) Analyzing and Interpreting Data; (SP6) Constructing Explanations and Designing Solutions; (SP7) Engaging in Argument from Evidence. This activity provides the opportunity to discuss the Crosscutting Concept - Systems and System Models, as students use the coin toss as an input and the resulting allele pair as an output. To recap the concepts of genotype and phenotype, I show the students this simple presentation using the familiar character SpongeBob SquarePants. I ask the class, "Does SpongeBob looks exactly like one of his parents? Do you look exactly like your Mom or Dad? Why?". I proceed to explain that the inheritance of traits is almost like flipping a coin and introduce the term probability as the likeliness of some event occurring. I bring out a coin, and ask, "What is the probability of flipping and the coin landing heads up? What if I do it twice, does that increase my chances?" Finally, I ask, "What does flipping a coin and talking about probability have to do with the inheritance of traits? Think for a minute and then tell your neighbor what you think (Turn and Talk). After the turn and talk, I ask for a couple of volunteer pairs to share their conversation with the class. I tell the class that today they will become parents to some monsters. Their job is to determine the genotype and phenotype of their offspring. I distribute the Monster Factory sheet and one coin for each set of "parents". If you have an uneven number of students, you can have the odd student do the activity on his/her own, but I'd suggest that he/she join a partnership and use their own flips and the "partner data". Some important information and tips for teaching this lesson are covered in this screencast. Once students have created the genotypes for their offspring, they move on to drawing pictures of them (phenotypes). I tell the students to make sure that their drawings are based on the data they obtained because they might be called upon to defend their explanations (SP7) during Student Exhibition Nights. Watch as a couple of students explain the activity and their work. The video also includes several monster phenotypes with their corresponding genotypes. I would love to hear what you think about them. Students satisfied with their drawings can navigate to the Genetic Breeder activity and attempt to produce specific combinations of traits in 8 generations or less, or even create a sibling for their monster. 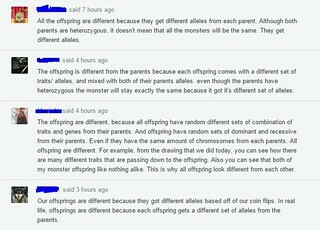 To close this lesson, I ask the students to look at the different offspring created by their tablemates, and respond to the following question, "All of the offspring created at your table are different even though they all come from heterozygous parents. Why are all the offspring different?" 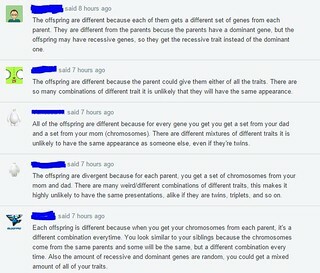 In their answers, I am looking for the idea that "an offspring randomly inherits half of his traits from each parent. As a result, each of their offspring inherited a different combination of traits." These are some examples of the student answers, showing exactly the kind of idea I was looking for.